I don't know, but for some reason I have been doing Gujarati food for the past two days. Yesterday I made Kachori and today Dhokla. Both are my favourites. Both are easy to make and very delicious. 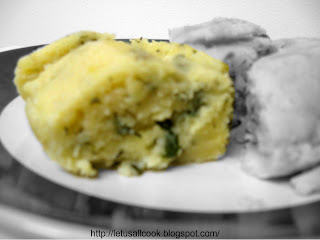 Dhokla, a famous Gujarati fast food, is my husband's favourite. This food can be eating as snack or even for dinner. It does fill your tummy! 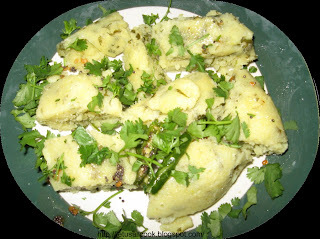 Dhokla is a steamed food and you can make it either in Suji or with besan or with channa dal. Though the authentic Gujarati recipe for Dhokla involves fermentation and channa dal, I tried the suji version yesterday and will share the recipe with you all. I will try to post the channa dal version of Dhokla soon. In a bowl, Mix suji, salt,yogurt,eno salt,green chillies,cilantro and mix well. Add little water and make the batter to the idly batter consistency. Rest the batter for 30 mts. Now using a cake pan or thali, steam this mixture for about 10 to15mts. Check regularly to confirm that the inside of this dhokla is cooked properly as you check when you bake a cake. Note: You need to grease the cake pan or thali with some oil so that the dhokla comes out without sticking. Let the dhokla cool for some time. 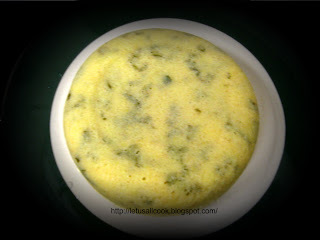 After it is cooled, remove the dhokla from the vessel and place it in a plate. In a pan, add oil, mustard seeds. When the seeds pops, add urad dal,channa dal, cilantro and green chillies. Add this mixture on the steamed dhokla and cut them into desired shape and serve hot with Mint Chutney! NOTE: You can also use idly steamer to cook this dhokla. Instead of the Idly plates use a flat bottom vessel and place it 10-12cms above the water level. I am sending this to the SWC- Gujarati Cuisine event. This month it is hosted by Priyanka of Asankhana. dhokla looks lovely, Sangeeth! You've made it perfect. Thanks for the easy recipe. I loved your mint chutney too. Have a great weekend ahead. wow,,,u r realfast,..thanks alot for the yummy recipe,..stilltimelooking forward for more,..and ya thanks for linking kachodi too...:-0hve great weekend,.. I love Dhokla. One of my fav snacks with afternoon tea. for mec, the entire dish has to be made in microwave!..you can use the batter and stream it in mw. Wow...this is my hubby's favourite.The dhoklas look yummy. Hey i love dhokla..but have never tried making it.Your recipe sounds yummy and I am surely gonna try it this weeknd.Thanks for the gr8 recipe.Keep up the gud work! dhokla looks pretty Sangeeth! u r realfast,..thanks alot for the yummy recipe,..stilltimelooking forward for more,..